As the head of an HR department or even perhaps of an entire company, it may be your job to provide some kind of get-together for your staff during the holidays. It is one of those hero/goat situations as a corporate leader that you face. Few people will quit a company over a lousy or nonexistent Christmas party but you're sadly mistaken if you believe it doesn't affect morale during the other 364 days of the year. Workforce contentment is a fragile resource that is far more important to your bottom line than you may realize. The impact of the annual bash runs surprisingly deep. First of all, it is imperative to adopt the right mindset for the event. The seasonal soirée should never be viewed as an obligation, but an opportunity to engage in team building and morale boosting. It is a chance to really get to know the people that are putting their finite lives to work making money for your business. The least you can do is drop the titles for a little while and interact with your employees as human beings you care about and value. You will not lose respect by being human instead of being the boss. Letting your hair down does not mean totally letting your guard down, however. By all means, have a drink with your crew. Encourage people to relax, but never overdo it with the spiced rum and eggnog. Be convivial but always be in control. Make sure you have a responsible after-party transportation plan for your staff and yourself. Don't assume your people will make intelligent decisions after they've been drinking alcohol. The last thing you need is for an employee to drive impaired and take a life on the way home from the party. Offer free cab rides or provide some other way of having designated drivers for partiers. This may not only save you from a potential lawsuit, but may even save a life. Not every company is flush with cash and for some businesses, Christmas is their slow time, unlike most retail companies. 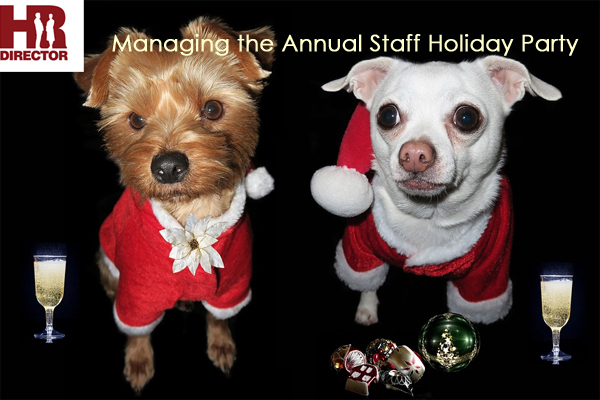 This doesn't mean you can't still make an effort to provide that opportunity for morale maintenance and even enhancement and to avoid the goat horns of holiday season failure. Here are some ideas that will festively mark this important time of year but cost the company little or nothing. Potluck Lunch: If buying lunch for everyone is not in your budget, invite your staff to bring their favourite dish to share along with an extra-long lunch to enjoy it. For many, it's not about who made the meal, it's about breaking bread together; an ancient method of creating and strengthening bonds between people. Share the Wealth: Many business people receive gifts from vendors, suppliers and service providers, usually for members of the management team. These gifts do not go unnoticed by your employees and jealousy from the feeling that 'the rich get richer' can be problematic. One solution is to save all such gifts for the potluck lunch and put everyone's name in the draw with the winners receiving the freebies. The Onus to Provide a Bonus: Every employee hopes for a seasonal bonus at this festive time of year but laying out straight cash like that may not be an option for every employer. However, failure to provide some kind of bonus will hurt you badly when your manpower is comparing notes with their colleagues in other companies. One option is to give each employee a coupon for an afternoon off. People value free time a great deal and will appreciate this gesture more than the cash equivalent. There is a cost, of course, but you'd already be paying them for that afternoon anyway, as it is a part of your labour overhead. Important! DO NOT use the frugality options if your staff is unaware of any financial challenges you have, or if you can actually afford a decent celebration. If you do, you will look like a Scrooge-level skinflint and take an employee job satisfaction hit you'd be better off doing without. Most employees have a clearer understanding of your fiscal realities than you think, however, and many are willing to work with their employer to get past the occasional rough patch. Providing the best festivities and bonuses you can afford will pay you dividends in morale, absenteeism and productivity.